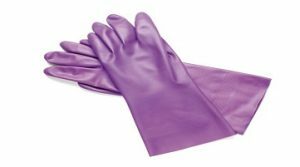 OSHA: When using a disinfectant wipe, what type of gloves should you use? The gloves types will vary based upon the disinfectant type, Safety Data Sheet (SDS) recommendations, and instructions for use. The SDS for Caviwipes, for example, recommends impervious gloves such as butyl rubber or nitrile for operations which may result in prolonged or repeated skin contact. The SDS for Prospray, on the other hand, states chemical resistant, non-latex and impermeable gloves are not required in the absence of biohazards. The main lesson here is that you must do the research on your chemical product to determine if the chosen personal protective equipment (PPE) is adequate. HIPAA: What is the fine for not having a Business Associate Agreement in place? In general, HIPAA fines for non-compliance range from $100 to $50,000 per violation (or record) with a maximum penalty of $1.5 million per year of violations on an identical provision. A lack of Business Associate Agreements could range from $31,000 to more than $750,000 based upon historical settlements. Karen, (the) seminar leader was a great presenter, made day interesting, educational, and fun.